Sonic the Hedgehog 44 is the forty-fourth issue of the Sonic the Hedgehog comic. This comic features one story: "Black And Blue And Red All Over". In Rotor's lab, Rotor is showing off some of his newest inventions to Sonic. He takes out a small gun, which he claims is the ultimate in firepower, which Sonic doesn't believe. He shakes the gun around, transforming it into a massive cannon with numerous barrels and attachments. Sonic is shocked at the sight of the massive weapon, while Rotor explains that it can blast through anything, whether it be a wall, door, impenetrable barrier, or even between zones. He compacts the weapon back into its pistol form and leads Sonic over to his next invention, which looks like a portable BBQ. As he opens the lid to the BBQ, an alarm goes off, interrupting his spiel. The two run off to the door to access a control panel to see what is up. The alert panel notifies them that there is trouble on the Floating Island, and likely with Knuckles. Sonic prepares to notify Sally, but she already knows of the issue, running by the lab and telling the two to follow her. They run to the Knothole Village hangar, where Antoine has their plane set up and ready to go. They board, while Sally orders Antoine to set a course for the Floating Island. On the Floating Island, a massive earthquake occurs that gathers the attention of Knuckles right away. He quickly glides to the Zoot Chute entrance and enters it, suspecting something is wrong with the Chaos Emerald. As he enters the Chaos Emerald chamber, he sees Evil Sonic arriving through a trans-dimensional portal, who orders Knuckles to hand over the Chaos Emerald or else. 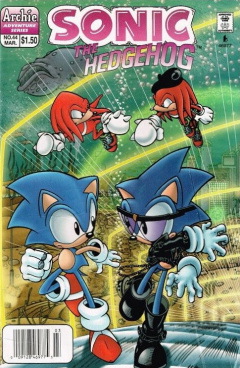 Knuckles prepares to fight for the emerald, but is knocked down by another being who bares an uncanny resemblance to Knuckles. The two share punches, but the other being eventually overcomes Knuckles, knocking him down. The Knuckles duplicate, who wears a beret and has an Irish accent, tells Evil Sonic that the portal is closing, so they decide to leave and return later to get the emerald. Just as the portal closes, Archimedes arrives, having heard about the trouble. Knuckles gets up, recovering from the attack, knowing that the two beings will return for sure. They exit the chamber as Archimedes tells Knuckles that the being that attacked him looked like him and that the other being looked like Sonic. As they exit, they notice the Freedom Fighter's plane on the island runway, while the Freedom Fighters themselves run up a steep hill to meet up with Knuckles. Sally asks if everything is alright, while Knuckles describes the beings that attacked him. Once Sonic hears about his duplicate, he instantly suspects that it was Evil Sonic that was responsible. Now that he knows who is responsible, Sonic suggests finding Evil Sonic and taking him by surprise. In order to locate their alternate counterparts, the Freedom Fighters take to the Cosmic Interstate on their plane, while Sonic runs along the highway. During the trip, Sally and Knuckles have a conversation about their past, as Knuckles is curious if Sonic is aware of Sally's knowledge of the Floating Island and their past. She affirms this, also noting that she has kept many other things secret, albeit, not easily. She recalls her first visit to the Floating Island with her father, when she heard rustling in bushes. She left her father and found Knuckles, where they eventually discovered they had many things in common. She had to keep their meeting secret, to not violate the rules of Knuckles' apprenticeship, hence why she kept her knowledge of Knuckles secret when they first met while with Sonic. They decide to change subjects, so Sally asks Knuckles how his quest to find the King's sword and crown is going. He reports that he has not had much luck, but that he will keep working on it. Meanwhile, they reach the off-ramp to the alternate universe, so they exit out and land near Sonic. As the Freedom Fighters disembark the plane, Sonic tells them the background on the universe, having been there alone prior: the Freedom Fighters are the aggressors while the bots are the oppressed, and thus, Robotnik is the good guy. In order to scout the area, Rotor takes out his flying remote scanner, which he will use to transmit data and imagery. While Rotor works on flying the machine around, Sonic ponders that their dependence on technology is ironic considering they're in a war against a technological enemy. Rotor shrugs it off, suggesting that they should fight fire with fire. In a nearby bush, Evil Sonic and the Knuckles twin spy on the group. They choose their targets and jump out to attack. Evil Sonic jumps at Sonic and tries to punch him, but is too slow as Sonic ducks out of the way, while the two Knuckles start exchanging punches again. The other Freedom Fighters, meanwhile, can only watch as the four of them scuffle. Rotor tells the others not to interfere, believing that Sonic and Knuckles can handle their duplicates on their own. The two Knuckles can't seem to hit each other while the two Sonics have a race of speed to try and get a hit in. Evil Sonic tries to punch him again, missing, so Sonic shows off his skills by going at hyper speed. Evil Sonic scoffs, claiming he can do the same thing. Back at the Knuckles battle, Tails starts to get bored, looking at his watch and wishing that the battle would end. Rotor, on the other hand, is enjoying the battle and witnessing the numerous fighting styles that are being exhibited. The evil Knuckles prepares another punch, but hesitates and stops, turning his back to Knuckles. The two Sonics return, as Sonic has Evil Sonic pinned down to the ground, demanding an explanation for what has happened. Knuckles also wants an explanation, especially why his opponent decided to back down. The other Knuckles explains that he should've never resorted to violence, no matter the reason, for somebody is draining the energy from the Chaos Emerald on his Floating Island. Knuckles can't believe that his counterpart would wimp out on protecting his island, calling him an embarrassment to all echidnas. The other Knuckles tries to explain, stating that the other doesn't understand. He leads the group out to the shore out to the sea, where the Floating Island typically is. He points to some bubbles coming up from the water, explaining that those bubbles are oxygen seeping out of a containment field on his sunken island, deep in the sea. The field is about to fail, and if it does, everything on the island will perish. The group board a vehicle that follows a tube network to the island, which is called Atlantopolis in his universe. They arrive on the island, instantly noticing that the air on the island is considerably thick, and that it will become thicker if they don't determine a way to power the air containment field. Sally and the other Knuckles are quick to hear an odd noise, that sounds like drilling or blasting. Due to the size of the island, it could be anywhere, so Sally takes out NICOLE, who is able to determine the location of the noise. They follow her directions and under an underground building, coming upon Dr. Robotnik. Shocked at the discovery of their arch nemesis in the alternate universe, he reveals his plans, to extract raw materials and a beta-test site for his inventions powered by the Chaos Emerald he stole from the island. He demonstrates his invention, a large gun, and fires at the nearby wall, which creates an interdimensional rift. He also has no need to worry about the citizens, as they take any disturbance he causes as natural. Evil Sonic is quite envious that Dr. Robotnik is exploiting his zone, wishing he did it himself. Despite this Sonic being evil, Robotnik is still not pleased with him, being a hedgehog, and orders his SWATbots to eject all the Freedom Fighters, and the alternate counterparts, into the sea. Tails is the first to be ejected, as he tries to hold his breath and head for the surface, only to notice many dangerous animals in the area. The next one up is Evil Sonic, who tries to stop being ejected out, claiming that it wasn't part of the plan. Using his brass knuckles, he knocks out all the SWATbots. With the coast clear, being able to swim, Rotor heads into the airlock to retrieve Tails, while the other surround Evil Sonic, asking him what plan he was referring to. Robotnik continues to smile with glee as he tests his new weapon, while Sonic and Knuckles return to him, now fully aware that Evil Sonic and him were working together. Robotnik turns the weapon on Sonic and Knuckles and tries to hit them, claiming that through each battle, he grows meaner and naster, and that Sonic will eventually wish he remained roboticized. The effects from the weapon destroy part of the wall of the chamber, revealing the Chaos Emerald chamber of the island. The two echidnas hop into action, avoiding Robotnik's weapon, and grabbing the emerald. In order to give the two echidnas a chance to prepare their plan, Sally and Sonic rush at Robotnik, distracting him while the Knuckles reposition the top of the emerald to face Robotnik. They call out to the doctor, who turns the weapon around and fires at them. The shot reflects off the emerald, hitting Robotnik and causing him to vanish, while the emerald is shattered and turned into 6 individual Chaos Emeralds. Knuckles informs the others that Robotnik has merely been transported elsewhere, while Anti Knuckles is more concerned about his island, which will lose its shield unless he puts the 6 Chaos Emeralds directly into the island's systems. He and Knuckles open up a panel and place the 6 emeralds in it, returning the power to the shield to normal and saving the future of the island. With all well, Anti Knuckles returns the others to the surface, telling the others that he thinks Robotnik was sent back to their dimension. As they arrive at the station on the surface, they are greeted by Rotor and Tails, who arrived back on land safe and sound. As they exit the shuttle, a tied-up Evil Sonic calls out to the others, while Anti Knuckles yells back to him that he'll take care of him later, while he helps the others return home. Before they do, however, Rotor calls back his remote scanner. He is upset for creating it for all the purposes they needed except for underwater. It's back to the drawing board for Rotor. This is the first comic in the main series to be inked by Andrew Pepoy. Rotor's lab contains a couple of in-jokes, including a poster stating 'you want it when?' and a TIE Fighter from Star Wars. Hangar 18 is incorrectly spelled 'Hanger 18'.